Smoking shisha is an art that can be easily corrupted if quality products aren’t used effectively or at all. If you were to compare shisha to wine, you’d find a few similarities, like the people who appreciate them are mostly interested in the nuances of the flavors. Although a great bowl depends on many factors, an extremely important aspect is the coals used to heat and burn the bowl. We’ve discussed the importance of heat previously, this is an in-depth peek at coal handling. There are natural coals and “quick-light’ coals. Both offer advantages and disadvantages and are best adjusted to the time and place you’re trying to smoke shisha. For example, quick-light coals are perfect for when you’re camping or anywhere that does not have a stove available. You can heat these coals quickly with a match and then place them on your bowl after they’ve turned gray. If you don’t wait for them to turn gray, you’ll get a foul taste in your mouth from the leftover accelerant that allows these to light up quickly. If you’re intending to smoke in a hookah lounge, you’ll be smoking using natural coals. They’re much preferable and provide a better flavor and heat time to your tobacco than the quick-lights would. They are not coated with an accelerator like the quick lights, and therefore take longer to light, but burn slower and have no effect on the taste of your shisha. As we stated previously, heat management is the key to having a great shisha smoke. The finesse involved with managing the perfect bowl has to do with the idea that you’re not burning the tobacco at all, you’re smoking it. When smoking a hookah, the purpose of the heat is to smoke out the delectable flavors that have been mixed with the tobacco with such care. You’re trying to pick up the honey, the molasses, and all of the other mixtures within a properly designed mixture of tobacco. For this reason, charcoal is better than an open flame which you’d use for actually smoking in a pipe or bong. If your tobacco is becoming ash in the bowl, you’re doing it wrong. 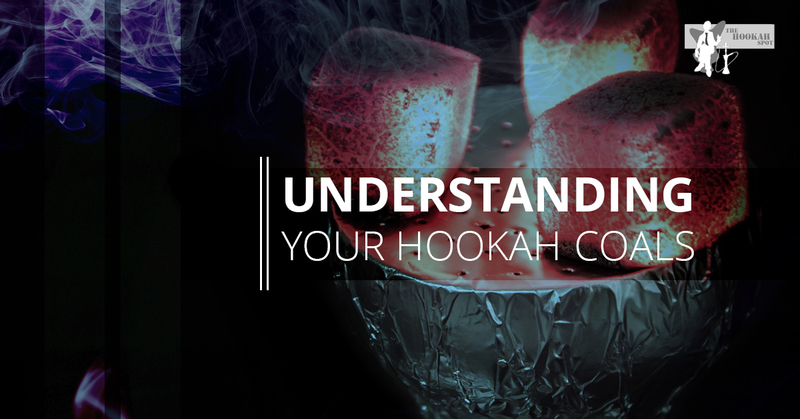 But when attending a hookah lounge, you won’t come across incorrect shisha practices, as all of our techniques are specially honed to give you the best smoke to truly enjoy the notes in the tobacco blend. The coals you’re using are made from pieces of pyrolyzed wood dust and, sometimes, chunks of wood. This wood is formed into briquettes through a process of heating and compacting them. Interestingly enough, there have been new coal creations that alter the original substance that coal is created out of. Recently, the hottest trend has been briquettes made from ground up coconut shells. This has been seen to alter the taste of the smoke favorably. It produces a mild, smooth smoke that blends well with all of the flavors you could dream of because of its original low profile taste. Natural coals should not be lit with a lighter. They require a direct source of heat, like your stove. When your coals are ready, they’ll be a subtle, ashy gray that appears closer to white at first glance. If you’re trying this at home and you have a ceramic top stove, you should potentially just put them in a pan and warm them like this. It could damage the stove top, which would be less than ideal. Interested in a tobacco experience unparalleled by anything else? Find our hookah lounge near you and come join us for some of our U.S. grown Tangiers shisha. What’s not to like? Comfortable cushions, sweet, fragrant smoke, and a relaxing atmosphere could make this Friday night unlike any other.